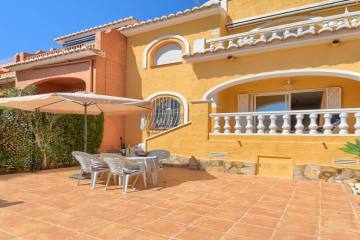 Refurbished South facing Villa on one level located in Javea on the Montgo-Valls side of Jesus Pobre. This modernised property consists of a spacious lounge and dining area with a fireplace and a glazed Naya (covered terrace) and beamed ceilings and a modern fitted kitchen and laundry room. There are three double bedrooms and two bathrooms (1 en-suite) with the master bedroom offering a dressing room. The outside area has terracing around the pool with Roman steps and a landscaped garden on one side of the house. The extras include a large drive area, double glazing throughout, carport and storeroom, new oil fired central heating and 2 separate vehicle entrances. The property is walled and fenced. Only 5 Km to the town centre of Javea Old Town with restaurants, tapas, library, museum and buses.